An enthusiastic young athlete who made rapid progress in his first year of sprint competition with coach Graham Howell. His second season saw rewards for his hard work. A bronze medal at Midlands Indoor 60m and bronze at Midlands outdoor 100m, plus representative selection for Avon Schools in the English Schools Champs and South West region at the Inaugural Schools Games in Glasgow. In 2007 Jamie again made good progress in the sprints breaking through to sub 11 second territory and English schools selection again. 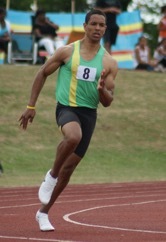 In 2008 Jamie made the 100m English Schools Final and again showed improved times in both short sprints. A Midland Counties Indoor 60m Bronze Medal in 2009. 2010-2011 were Jamies peak years, which saw him improve his best over 100m with several clockings under 11s and a windy 10.79s at the AAA’s U23 Champs in Bedford. A successful 60m indoor season in 2011 pushed his lifetime best down to 7.03s and a Midland Silver medal. In 2018 he decided to give endurance running a go, recording a 53 minute 10K!